"With a handful of laughs and some mad rescue roping skills they were pulled back to the dock!" It was not a fairy tale, but a rescue on a Minnesota lake did involve a rainbow unicorn. A sheriff's deputy and a reserve deputy from the Chisago County Sheriff's Office spotted a group of five women on a large, inflatable rainbow unicorn floating on Fish Lake Saturday. KMSP-TV reports the deputies pulled their squad car over and asked the women for a photo, but noticed the raft was stuck in weeds. One deputy threw a rope to the women while the other recorded a video. A sheriff's office tweet says, "With a handful of laughs and some mad rescue roping skills they were pulled back to the dock!" 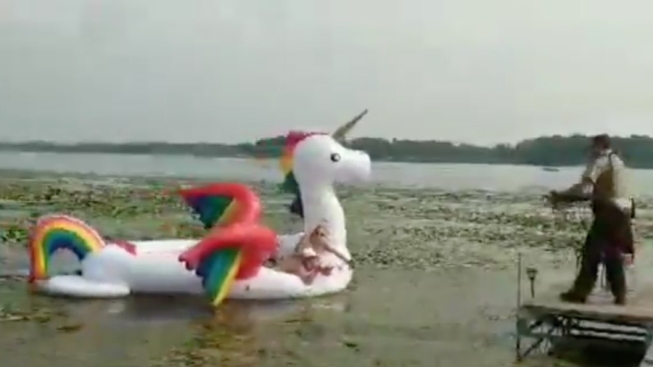 A sheriff’s deputy reeled in a group of women stuck in their unicorn floatie on a lake in Minnesota. Deputy Scotty Finnegan, who threw the rope, says the women would have had trouble getting out of the mucky lake unassisted.